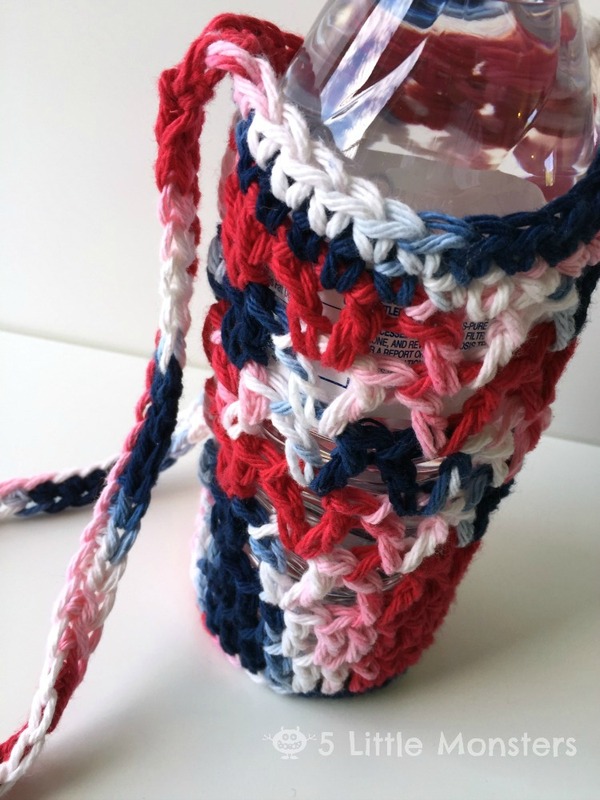 I am excited to share my red, white and blue project with you. As I was trying to think of a something to make I thought of how hot it can get being outside all day, from parades, barbecues, and family get-togethers to fireworks in the evening. 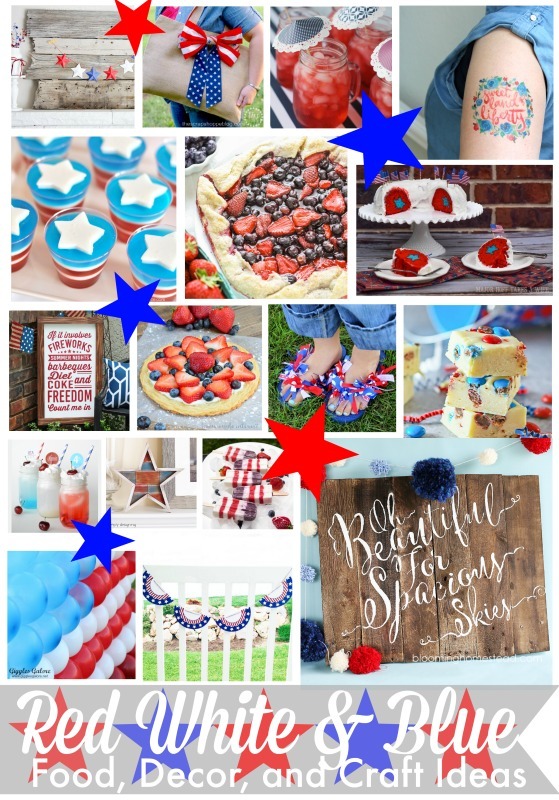 The Fourth of July can be a long day, especially for kids. 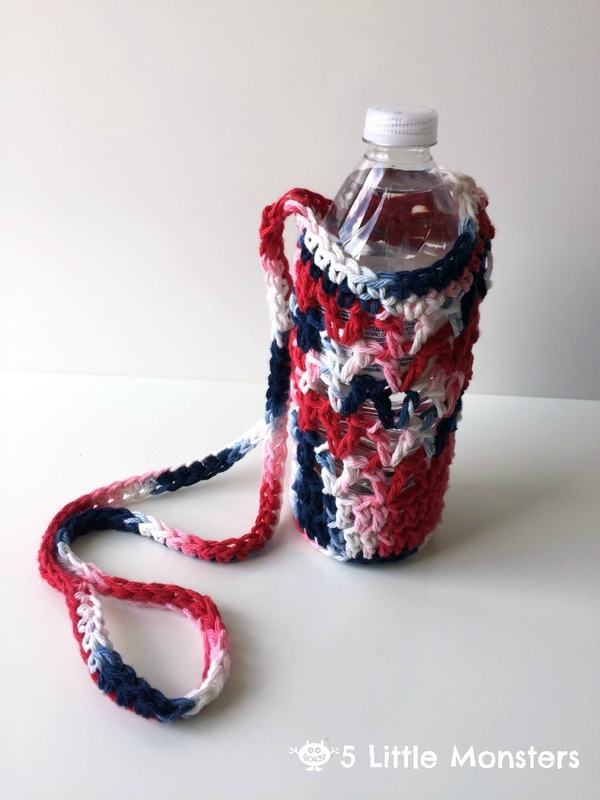 Water on a day like that is an absolute must but I don't want to lug around water bottles for all five kids so I thought I would make something that would allow them to each carry their own water bottle. 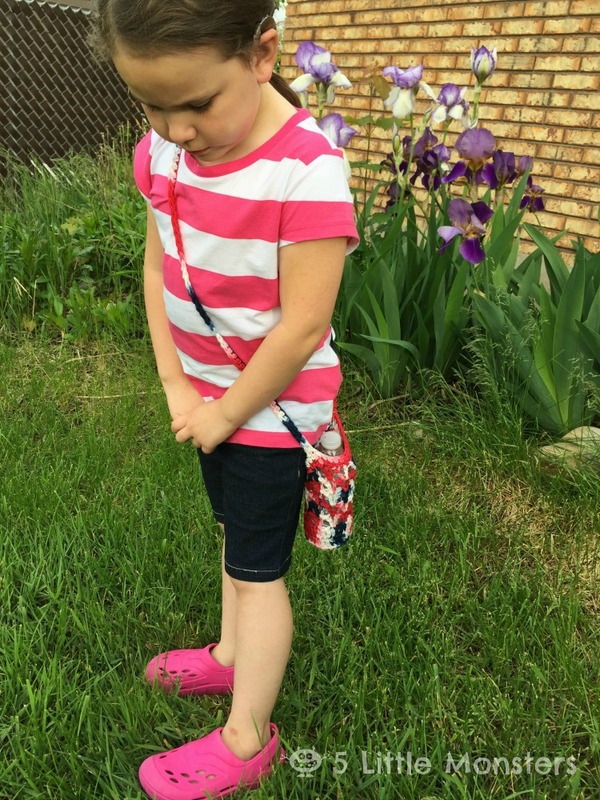 They are perfect not only for the 4th but for all summer, they would be super handy to have for trips to the zoo or even just a walk to the park. 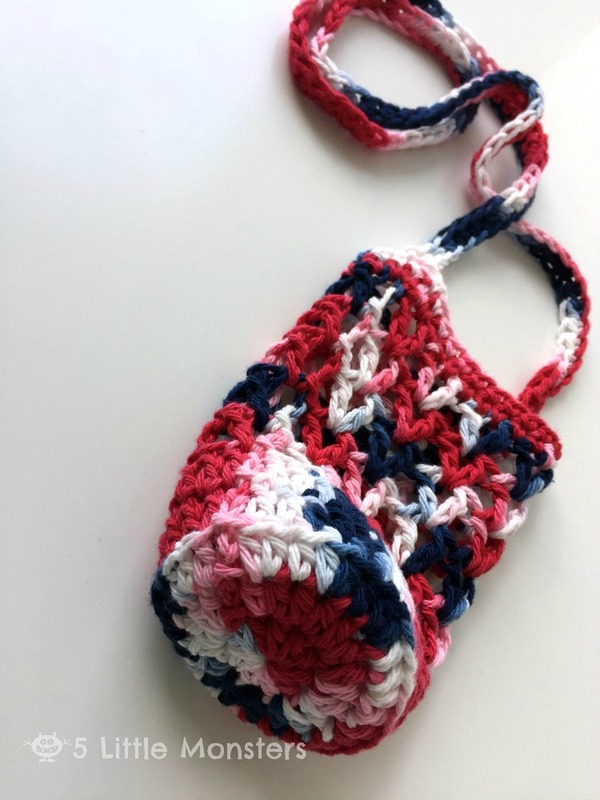 I made mine using cotton yarn in a variegated red, white and blue colorway to celebrate the 4th of July but you could make one in any color. 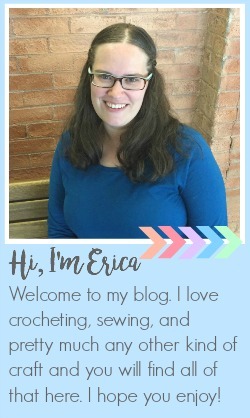 I am thinking I need to make 4 more, each in a different color so that the kids can tell them apart. It holds both 16.9 oz bottles and 20 oz bottles. 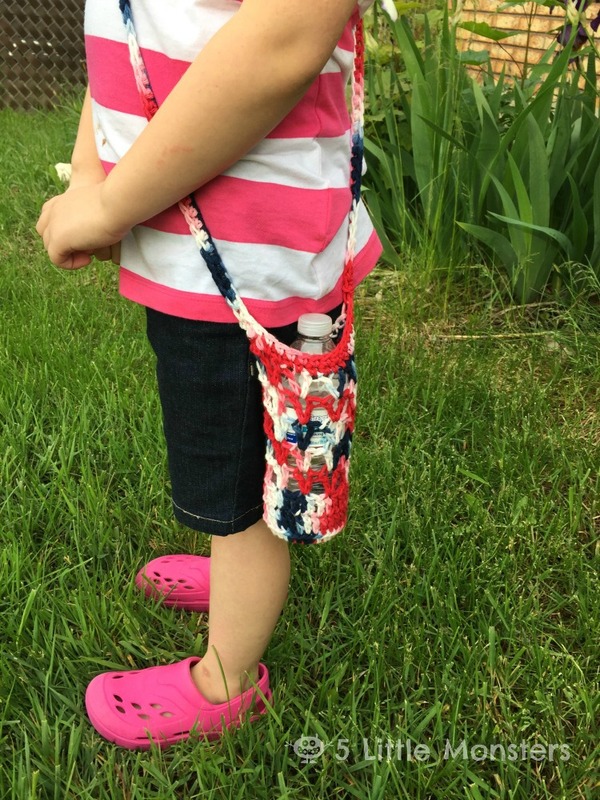 I made mine to fit my 5 and 6 year olds but you can easily make the strap longer or shorter to fit a bigger child, an adult or a smaller child. Now you have finished the base. To begin the sides the next row will be worked in the back loops, I actually worked through both the back loops and the loops behind the back loops to give it some extra sturdiness. Strap: ch 100 (or as many as needed to make desired size strap), being careful not to twist the ch slip stitch to the other side of the holder directly across from where you started the ch, slip stitch to the next stitch to anchor the strap, hdc in each ch back to the other side, slip stitch to anchor. My daughter loved being able to carry around her own water bottle in a special holder. I think these will really come in handy for our family this summer. Hopefully they come in handy for yours as well.